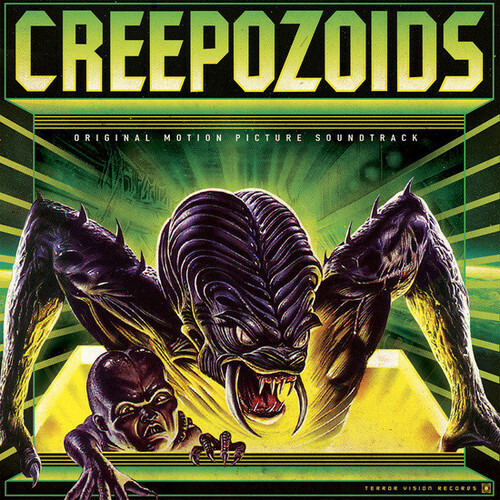 Terror Vision presents the original soundtrack for Creepozoids, a cult classic sci-fi/horror film from 1987 composed by Guy Moon . Creepozoids is a cult classic sci-fi/horror film from 1987. This post-nuclear film focuses on five soldiers who’ve gone AWOL and hide in a subterranean lab to escape the deadly acid rain that’s falling above. What the soldiers don’t know, but will soon find out, is that this lab accidentally created hungry insectoid creatures, that wait to feed on them. The soundtrack might be better than the movie. Liner notes by horror queen Linnea Quigley.